Stayed for a week in February 2018. You no longer need to go AVIS to get your parking permit - the hotel check-in handles it all. We purposely stayed here, even though there is a small fee. We enjoy using the pool and hot-tub, which is included with the RV Parking fee. The dump was also included in the weekly fee. We parked in the upper area. Although there is a slight slope, we easily leveled our 40' MH. There were over 50 rigs in the lower parking area. The casino is normal and the food was good. We found the hotel/casino staff nice, but nothing special. Quiet at night, but cars zooming by during the day. 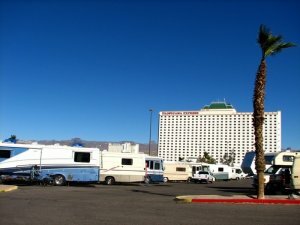 The RV Parking areas aren't too far from the casino. Got a players card, but it doesn't get you much to begin with. No freebies with the card unless you loose money on your first day. They'll then mail you a voucher for the money you lost, up to $100.